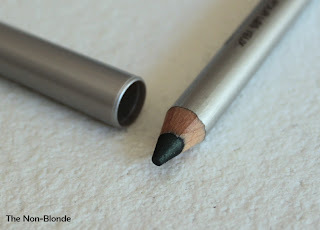 Laura Mercier eye kohl pencils are the best getaway to colored eyeliner. If you're curious but wary of lining your eyes with anything other than black and brown, these blackened shades of purple, teal and others will show you how a hint of color brings out your eyes in a new way. There's nothing 80s about Laura Mercier's makeup, I promise. Antique Jade Kohl Eye Pencil is a rich blackened emerald. It doesn't look green, but has a greenish cast that work exceptionally well with the fall 2011 Laura Mercier Canyon Collection. It's formulated for use on the waterline and is perfect for tightlining, directly or by picking the color with a brush. I know that some people experience longevity and migrating issues with Laura Mercier's kohls, but unless I'm having a bad allergy day I find them satisfyingly tenacious. 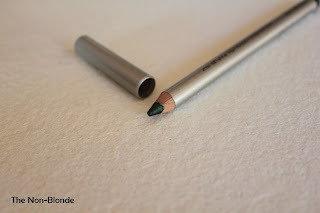 Laura Mercier Kohl Eye Pencils in Antique Jade and other colors ($19 each) are available at the counters, Sephora and lauramercier.com. Right now there are limited edition holiday sets of these kohls- full size and mini- at great prices. Highly recommended. I get so close to buying the mini kohl set every year. This year I was good and opted for a single Caviar Stick Eye Color instead. Maybe next year will be the year I finally buy the set! The colors of LM's kohls are just exceptional. Looks gorgeous. 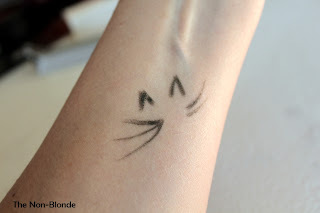 I'm one of those people that always stick to black and brown liners, but now I want to give this one a go.